well folks, I bought one and the red light came on. parked it a while and brought it to galaxy electronics in new Orleans. the man smiled and said he would make it sing again. so I went get it. he said he put sanken finals and it would pump. so I brought it home and saw a pair of 5500x on ebay I bought them but the woofers were out. I bought a pair of 4 ohm boss woofers and put them in. I had to open up the port a bit but it fit after. so, after listening to the matchup, I would rate the sound quality as being in the recording studio. all those songs have hidden things which you hear with this set up I suppose these setups of 10 or 20 grand will deliver like this. This thread clearly has a lot of very good ears and refined grey matter. I purchased my 9090DB in 1978 when I was attending General Motors Institute. Paired it with a Nakamichi cassette deck (sounded good, but unreliable), an Onkyo turntable (still have it) and Ohm C2 speakers (cones dry rotted in storage, but still have them). The 9090DB is still used weekly and is as strong as ever. I read that capacitor replacement ("recapping") will make a good old receiver into a great old receiver. Have any of you 'recapped' your receivers to sharpen the already good sound? I purchased my 9090DB in 1979 at United Audio in Chicago. Years of PLEASURE!!! What a unit. Purchased the Sansui 9090DB new back in '76. I recall paying over $300 for it at the time. Basically, that was about a week and half's take home pay for me. I've loved this receiver since day-one. Over the years, it has gotten relegated to my garage. I used to drive my landscape speakers and garage speakers. Decided to bring it back into the house today (forgot how heavy this sucker was). A few of the display lights didn't work and the pots. need to be cleaned. I spent about twenty minutes getting the display lights to work again, and I'm heading to RadioShack tomorrow to get a can of cleaner and lubricant for the pots. A little TLC and this sucker is going to be as good as new. My brother purchased the 8080DB around the same time and he still uses his to this day. If you are fortunate enough to already own one of these, never let it go. If you ever find one, buy it! i went to a yard sale last friday and i saw this sleeping beast! the owner told me to make offer.my first offer $50 and the owner said yes! he said he needs money.i almost give him an extra $50 because of an excitement.for $50 ? lol! 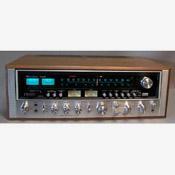 I bought a sansui 9090db in 1976 in japan and it gave me many years of service. I had 4 pioneer 911A speakers with this power house. I have never had anything close to the sound this receiver had. Just the other day I went to a lawn mower shop to get some blades and low and behold there was a sansui 9090db on a shelf collecting dust. I asked about it and the man said that old thing has been sitting up there for 30 some odd years. I had to ask if he would sell it and he said sure $5.00 WOW! I took it of course. Took it home dusted it off, Polished it and it looks like it just came off the show room floor and works just as good. Yes it was my lucky day. I am also surprised that few posters identified the problem in the left channel -- it goes out if the circuit board is not cleaned frequently. I think circuit traces in the left channel may be too close together. I am also surprised that one poster thought it was junk. I believe his unit may have been malfunctioning. My son, who is an audiophile and iintends to build his system around VTL (tube) or Musical Fidelity (transistor) amplification, agrees that the Sansui gives great sound for the money. However, I agree with him that the VTL and MF amps sound significantly better that the Sansui. Sounded great with my son's Vandersteen 2CE signatures, although the sound got a llittle hard playing complex orchestral works at high levels. The Vandys excel at reproducing male voices, and the Sansui sounded really good, almost, but not quite as good as a Rogue (55 w/ch, tubes) with them. These are great old receivers with a "tubey" sound, somewhat loose bass but warm and sweet overall. Though they don't match the better modern gear, they are a great bargain at about $200 used. If the left channel is out, you may have to pay up to $400 to replace blown output transistors. But that compares to paying about $1500 for a used VTL 60 wpc (tube) integrated (which admittedly sounds significantly better than the Sansui).. It's tough to get the sound of the Sansui for the same money.